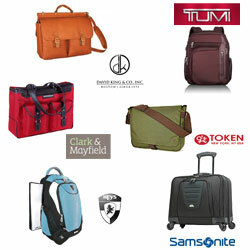 There are many different laptop luggage brands available. From casual trendy everyday laptop bags to high-end designer brands. Most luggage brands have specific target market in mind, e.g. business people, students, women, leisure travelers, as well as fall within a specific luggage price range (budget). This article compares the most popular laptop bag brands. The following luggage comparison table lists the main laptop luggage brands in alphabetical order. Just click on the brand name to view the particular products on offer. The luggage type indicates the type of laptop bags offered. Most luggage brands specialize in certain luggage types, like business laptop cases or computer backpacks. Many luggage brands offer few types of luggage but usually for similar target group, e.g. trendy backpacks, messenger bags and laptop sleeves aimed towards young people, or stylish business laptop cases and briefcases for both sexes. The luggage type shown in our laptop luggage comparison table may not show all the types of bags on offer. It still gives an indication of what type of laptop bags you can expect to find within this particular luggage brand. The target indicates the target market, i.e. is this luggage brand likely to appeal to young people, students, women, business people, travelers or people of all ages. The budget range indicates the price you can expect to pay, i.e. allowing you to compare the price of the different laptop luggage brands. To make the luggage price comparison easier there are three luggage price categories. The price range shown in B for Bag luggage comparison table represents the price range most of the laptop bags fall within but some bags may still fall in the price range below or above. However, the price range shown indicates if the relevant luggage brand can be considered low, medium, or high-end price wise. B for Bag luggage comparison table shows the most popular laptop luggage brands and those with the widest laptop bag range. The aim is to help you compare the different luggage brands but you can view the full laptop bag range in our Laptop Luggage Shop.